Introducing MACY AND MIA for trendy, cruelty-free beauty! Hi there, my darlings! Welcome to another one of my involuntarily infrequent posts. Despite my best intentions, I'm increasingly finding managing my schedule with the huge time difference quite the challenge. Read: this night owl gets very sleepy! I must be getting old! But stick with me, my darlings, just until the end of the year when the move back to the Western World is scheduled. Things should get back to normal, or a close approximation thereof, by then! Anyways let's celebrate the fact that dawn is just around the corner in this part of the world and yet I have stayed up to share! Yay! Today, I'd like to introduce you to a new brand, Macy and Mia! The baby of DJ Victory, a long-time makeup artist, the brand is an independently run small business and proudly cruelty-free. All things I can totally get behind! So, without further ado, take a peek at some of the trendy, Instaready products I had the opportunity to test and review. I may be getting too old to pull the all-nighters off my teenage years but is anyone ever to old for a little unicorn magic, especially when it comes to makeup brushes? I say not! Since DJ started her line with makeup brushes, it goes to show that these, more than anything else, embodies the spirit of the brand. These brushes are not your cheap knock-offs but just by the feel and texture of them, you can tell a lot of love and thought went into sourcing these. Now, I don't know if I'll ever really use these cos they're just too pretty...except for maybe highlighter! 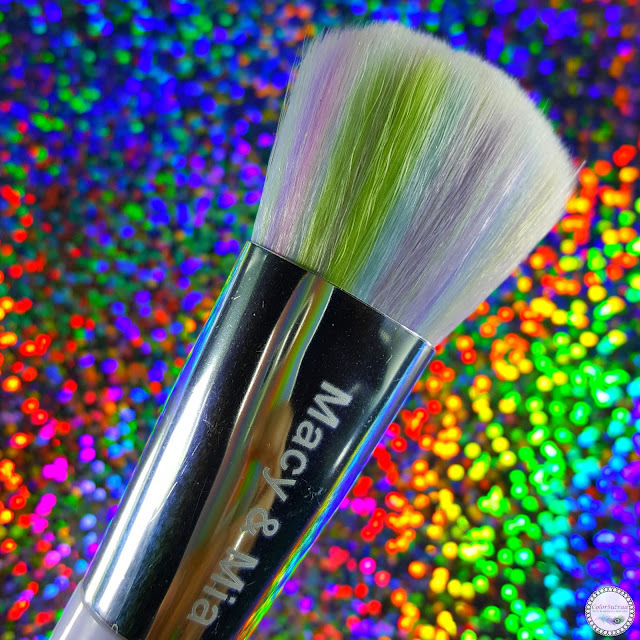 Because a little shimmer and sparkle on a rainbow-hued brush is nothing short of magical! I've been DYING to try a silicone sponge applicator because it's all the rage on Instagram and you know, science and whatnot. So, I was really thrilled when this little beauty was included in my package. My thoughts? I still prefer my beauty blender for full-face foundation application and my handy makeup brushes for blush. But I will say that I do like this sponge for highlighter application. A silicone sponge doesn't absorb product so you need to use much less. You just dab on the product and just about all of it transfers to your face, rather than sitting on the applicator. A huge win when we're talking about precious highlighter, especially if they are limited edition like some of my favorites. At this price, it's definitely worth a try! 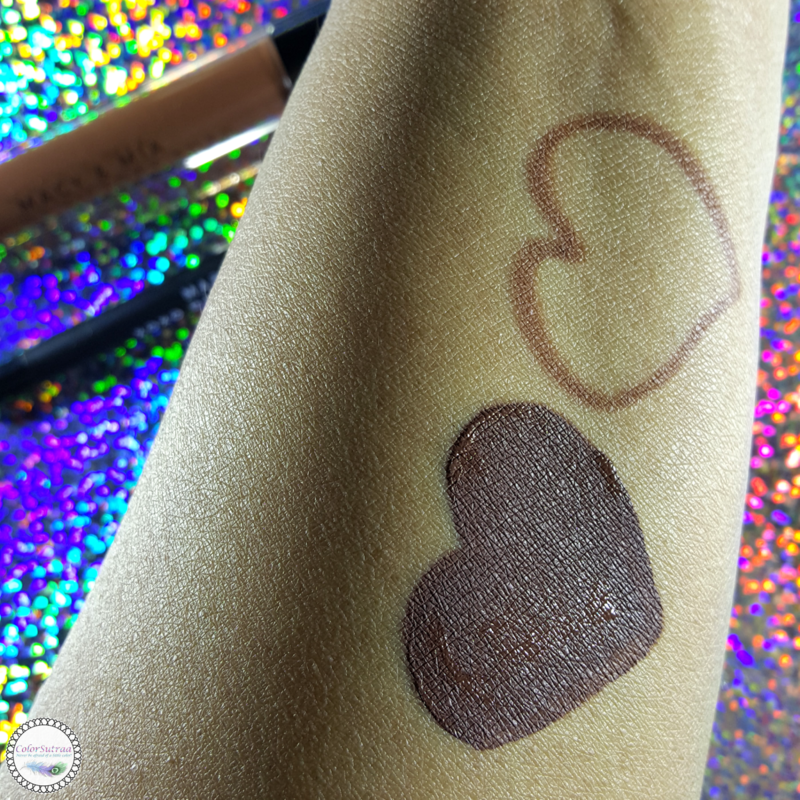 I have to admit that I was exactly blown away when I first saw this shade in the tube. I'm kinda traditional when it comes to lipstick favorites and stick to my berries/reds/pinks. Even brown seems a little too experimental for me at times. That being said, swatched, this is a beautiful, flattering brown. Perfect for Fall, especially if layered under a sheer, metallic topper or gloss. 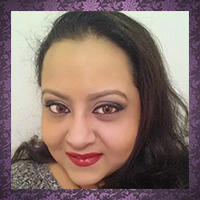 I also really love the smooth texture and easy application of both the lipstick and liner. Plus, it does NOT budge! You will need a good makeup remover to get this baby off. My review package came in this cute little bag, embossed with Macy and Mia's motto. 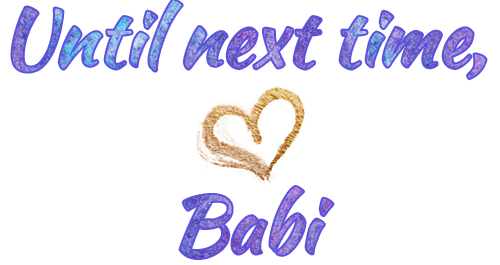 While currently not on the site, I wanted to show it to you anyways in the hopes that she will add it to the site soon! 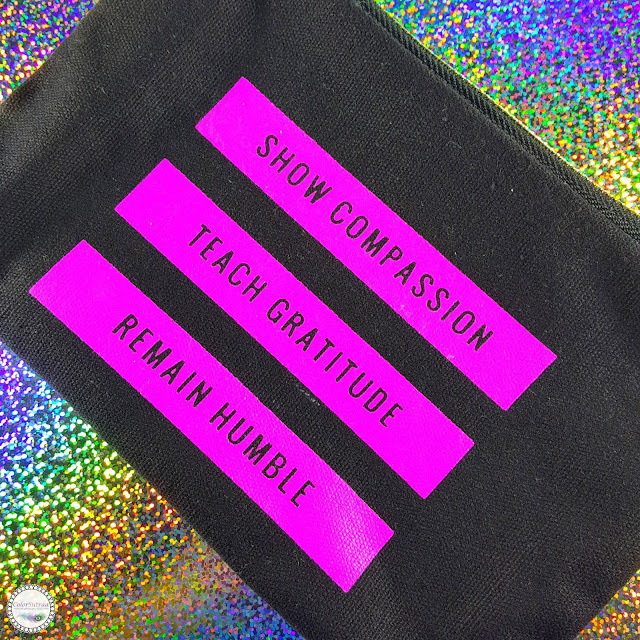 Because who wouldn't want such a positively reaffirming little makeup bag? So there you have it, my darlings! You can pick up any of these gorgeous product on Macy and Mia's site HERE. NOTE: 10% of all purchases will be donated to Pay it Forward for Pets, a 100% non-profit organization. What are your favorite trendy beauty products? Tell me in the comments section below! Those brushes are absolutely adorable! 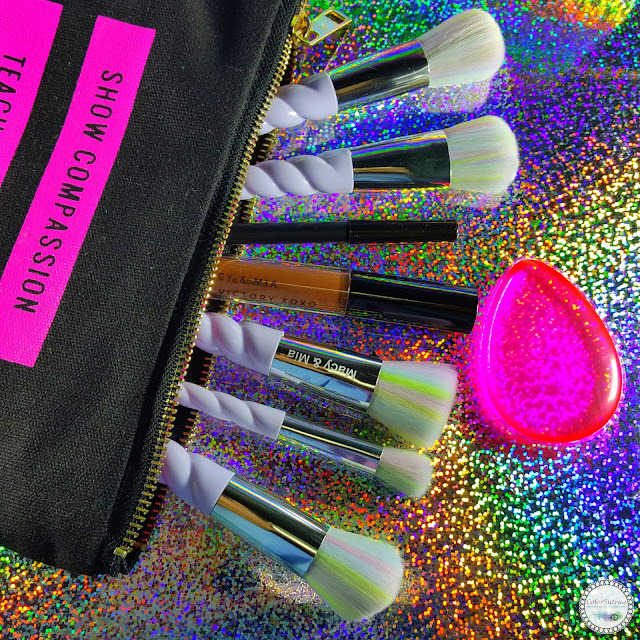 A new brand, and what cute makeup brushes! Aren't the brushes cute! It's so fun to see these cheery tools on a dark gloomy morning. 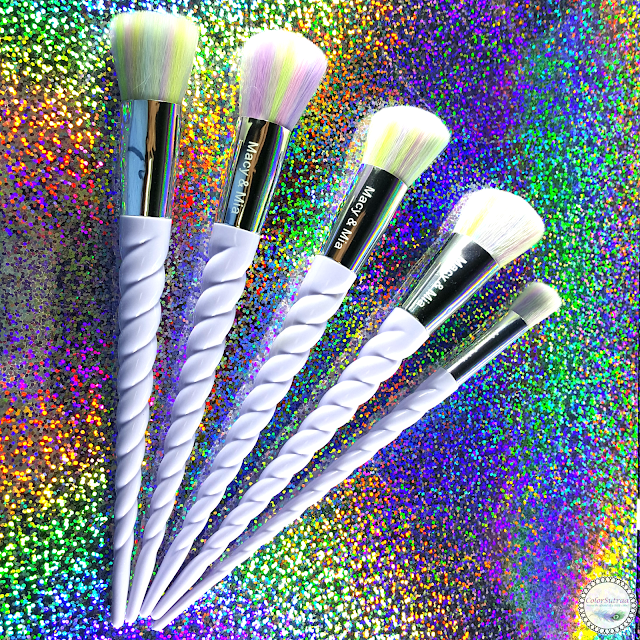 Oh my goodness, I need those pastel unicorn brushes!! They are so pretty!! Those brushes are SO adorable!! I haven't tried a silicone "sponge" yet but it's definitely on my list. Such a cute brand. I love the look of those brushes! I just got my first unicorn brush and now I want a few dozen of 'em LOL.